Orange Beach vacation rental. Large first floor condo, 3 bedroom, 2 bathroom open floor plan with large kitchen and living area. Swimming pool and lake gazebo access with grilling areas. Within walking distance to dining and nightlife. Pedestrian red-light crossing to beach access. Fully furnished unit with linens/washer and dryer, dishes and dishwasher for dine in dinners or money saving lunches. Master bedroom has a king bed with connected master bathroom. Second bedroom has queen bed connecting bathroom. Third bedroom has 2 bunk beds and connects to second bath with private door. Unit has new mattress's, new furniture in den and remodeling throughout. Local semi-retired business owner. Enjoy traveling, sporting events, and concerts. Have owned vacation home in this area for entire adult life. Have enjoyed family vacations in the area for the past 40 years. Condo was well clean and stocked. It was close to beach 😀. Parking was good. Had minor issue with WiFi , did not have clear instructions on how to connect. Made call to Calvin and within couple minutes we were able to connect . Great, affordable family condo near the beach! The condo was clean and had everything we needed. Just a quick, safe walk to the beach with a stoplight to cross the road. 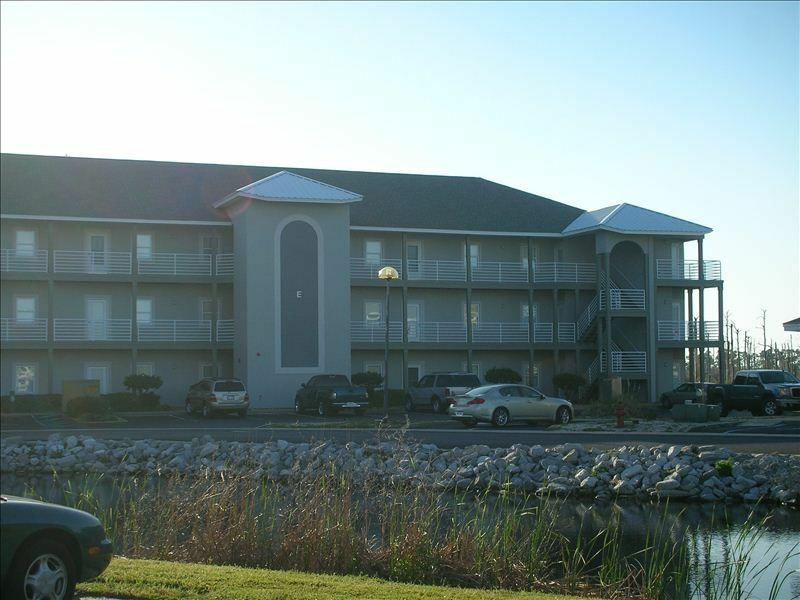 Great location right by Gulf Sate park and so close to Gulf Shores as well. We loved all the wildlife at the lake right on the property. The pool was beautiful but not heated, so a bit too much like the Ocean water temp. Kids didn’t mind though. Overall, highly recommend. The property is well stocked for eating meals in and is conveniently located in relationship to the beach. The crosswalk to light to the ocean is directly out front from the condo and the light changes immediately. The unit we stayed in was first floor which was nice. Calvin is very quick to answer any questions you might have. The pool was well kept as well and was not overly crowded the times we used it. Wal-Mart Market is within a mile or so to get groceries. Overall this condo was great for two families with 3 small children. It had a lot of room to for the kids to run around. It's extremely close to the beach which was awesome! We could pack all the beach supplies up and take the kids to the beach in minutes. The condo had a ton of towels and enough pots/pans too cook meals. The beds were all really comfortable including the couches. The sleeper sofa is not good and would definitely not recommend anyone try and use. The mattress looked very dingy and was extremely thin. One area to improve upon is the kitchen and dressers in the bedrooms. The dressers had some broken drawers that my husband actually fixed but you could not use. The kitchen had and additional microwave sitting on the counter due to the above stove microwave not working. The refrigerator door was also broken. It was also a little unorganized with remnants of prior guests items in drawers. All in all these minor issues would not prevent us from staying here again. Decent accommodations for the price and proximity to the beach. The condo was not very cleanly. The windows were moldy, light fixtures had smudges/dirt, shower knobs moldy, and floors were not scrubbed. Remants of previous visitors should be discarded (loofahs, clothing, junk in drawers/fridge). Appreciated the variety of appliances (blender, dishwasher, toaster oven), however needs updated pots and pans for more functional kitchen equipment. The pool was close and a definite bonus during our stay. It was plenty of space for two families (8 people). TV had Netflix and cable which was nice after a long day. More toilet paper supplied would be great, as we only had a few rolls for our 5 night stay and had to replenish. There were plenty of towels though. Great location to beach and attractions! The gulf was only a short walk away. Owner was responsive. Overall, we enjoyed our vacation. Non smoking unit and must be 25 to rent! !